"This soup is full of healthy antioxidants. 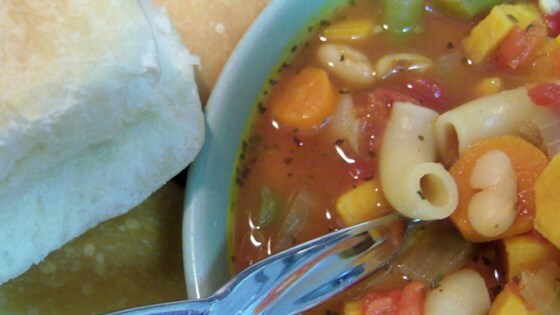 A very hearty soup for a cold winter night! I serve it with hot garlic bread. If you are lucky enough to have leftovers, it's great the next day!" Heat oil in a soup pot over medium-high heat. Saute onion, celery, Italian seasoning, salt and pepper until tender, about 5 minutes. Stir in tomatoes, with the juice, broth, sweet potatoes, carrots, green beans and garlic. Bring to a boil; reduce heat to low and simmer, stirring occasionally, until vegetables are tender, about 30 minutes. A good start. I'd recommend adding cannelini beans and pasta for the full experience. I also substituted some apple cider for some of the liquid - a nice touch in the fall. Thsi was really wonderful! When I placed in front of my kids they thought they were going to hate it--but they loved it! My husband said, "Honey, you can make this anytime you want!" Really good, tasty, hearty. I added a can of rinsed kidney beans and served with cooked tiny pasta shells.